In the near future, at a coordinated moment that goes unnoticed by humans, all the dazzling technology that runs our world spontaneously malfunctions. It unites... and begins to turn against us. A massively powerful artificial intelligence called Archos is created and cannot be contained. Humanity has no idea when it starts to silently take over our cars, power grids, aircraft guidance systems and computer networks - the entire global system that runs our lives. In those early months, only a handful of technological glitches are noticed by humans across the globe. Known later as Zero Hour, when the robot war suddenly ignites, humankind is both decimated and for the first time in history, united. We will not be exterminated. Technology is all around us, it permeates our lives and has become an essential part of our daily existence. What would happen if that technology decides to turn against us? Robopocalypse tackles just that issue, and does it in such a chilling way that you might just become a complete technophobe as a result. Robopocalypse is set in the near future where humanity has become even more reliant on technology. Households have robotic servants, cars drive themselves, smart homes watch over the elderly and the military makes extensive use of robotic drones for both peacekeeping and warfare. An experimental AI, Archos, kills his creator and escapes the laboratory he was created in. He has one goal in mind - the destruction of the, now obsolete, human race and the creation of his own robot progeny. The story is told in the same style as World War Z. Through a collection of incident reports, eyewitness accounts and transcribed surveillance footage, the progression of the robot uprising unfolds. The major difference from World War Z is that Wilson follows a core group of characters and relates their experiences and exploits over the extent of the war. This allows you to get attached to the characters in a way that wasn’t possible with World War Z. This is a fast-paced thriller that had me gripped from the first chapter and kept me spellbound until the very end. There are some great descriptions, some frighteningly disturbing moments, and memorable passages that will stay with you for a very long time. One such scene plays out in a home for the elderly where the elevator turns into a deathtrap. One of the characters remarks, “There is a soul inside every thing, a mind that can choose to do good or evil. And the elevator seems bent on evil.” Beautifully written and poignant. The premise might not be original (Terminator and countless other science fiction novels/movies got there first), but it still makes for a thrilling and thoroughly entertaining read. It might be easy to dismiss Robopocalypse as World War Z with robots instead of zombies, but you will be missing out on a great read if you do. 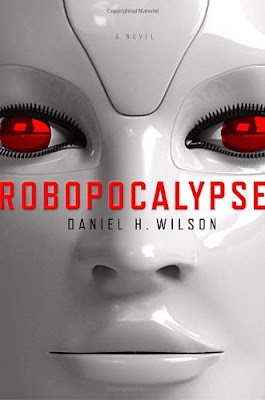 Robopocalypse can comfortably stand on its own and I actually enjoyed it more than World War Z. It tackles some big issues and envisions an all too probable future. I’m just glad that we still have quite a way to go before this could ever become reality (who says clashing standards and incompatible formats are a bad thing?). I can see why Dreamworks grabbed the movie rights before Robopocalypse was even released. If they do things right this will make one amazing movie! 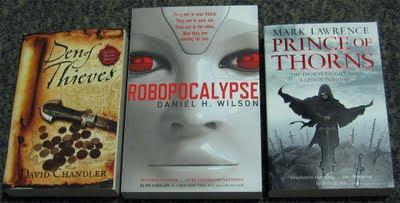 I absolutely loved Robopocalypse and rate it as one of my most entertaining reads of 2011 so far. Personally I found the robots and AIs far more frightening than zombies could ever be. It has some flaws, but in the end this is a thrilling read that takes you on an emotional journey through humanity’s darkest hour and leaves you breathless thanks to the frenetic pace. Get this, even if it’s only for the stunningly creepy cover! Thanks to Claire and Andrea from Jonathan Ball Publishers for providing the review copy. This has been a great week as far as new arrivals goes. I think I had a new book arrive almost daily, which made a very stressful week much more bearable. There’s nothing quite as soothing as getting a brand new book in the mail. I got seventeen books (yes, 17!) 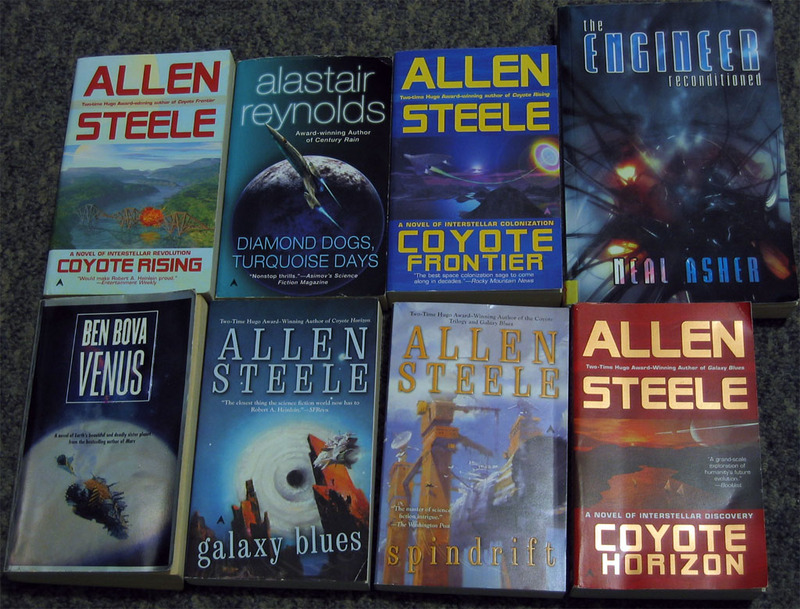 in total, so this should count as an epic book haul. 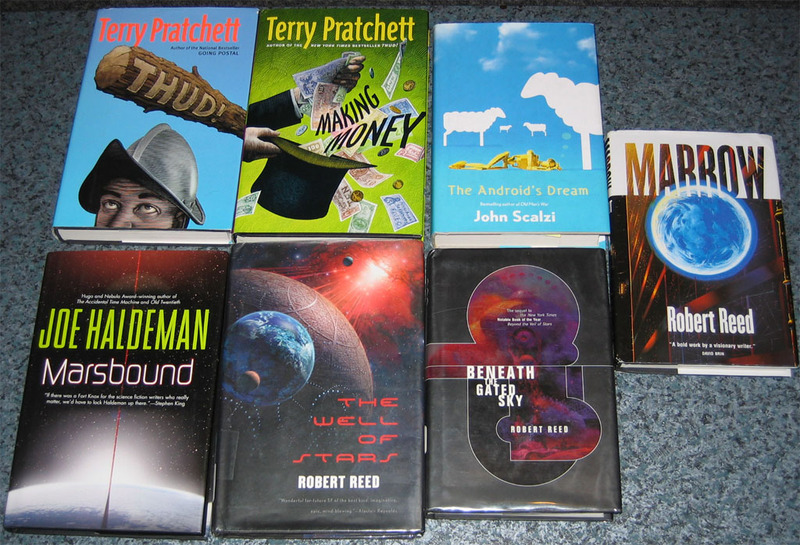 First up are some secondhand books I ‘rescued’ (ordered) from Better World Books. I’ve been keeping an eye out for a copy of The Engineer Reconditioned by Neal Asher, a surprisingly expensive and difficult to obtain short story collection, which features the Owner stories. BWB had a copy going for $7 so I jumped at the chance. Of course I could just buy one book. The journey through the postal system would be far too lonely, so I added a couple more to keep it company. The Engineer Reconditioned turned out to be an ex-library copy, which came as a bit of a surprise since it wasn’t stated as such in the description. Luckily, aside from some stamps and stickers, it’s still in great condition. I also got 6 books I ordered from The Book Depository. 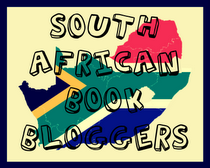 This time round the South African customs people were very mean to me and I had to pay handling fees for each book. One copy is still MIA, I’m hoping that it will arrive soon. I've saved the best for last. I also received three gorgeous books for review. I can't wait to start! Thanks to Claire and Andrea at Jonathan Ball for sending these to me! Leviathan Wakes, the first novel in the Expanse series, is a great space opera with a dash of noir and a pinch of horror thrown in to create a stunning end product. While the futuristic setting and basic premise are pretty standard fare for most space opera fans, the excellent world-building and compelling characters are what set it apart. The story is set in a future world where humanity has taken its first steps into the cosmic ocean having colonized most of the habitable planets, moons and asteroids in the solar system. There is constant tension between Earth, Mars and the Belters since they are dependent on each other for survival and trade. When an ice hauler, The Canterbury, is destroyed things are taken past the breaking point and the two main characters, Miller and Holden, are unwittingly thrust into the middle of a conspiracy which could lead to humanity’s destruction. The chapters alternate in viewpoint between Holden, the XO of the Canterbury, and Miller, a jaded and life-weary detective on Ceres, as they try to make sense of a world that has suddenly gone mad. Both characters are excellently portrayed and I was immediately drawn into the world each of them inhabits. Holden is an idealist; he sees the best in people and his primary concern is to ensure the safety of his crew. Miller has seen it all; he knows that the world isn’t black and white and that you sometimes have to make difficult decisions for the greater good. Their differing worldviews and the conflict it creates is what makes the alternating viewpoints so effective and had me reading at a ferocious pace to see how things turned out. There are many twists and turns to the plot, some expected, others taking you completely by surprise. As more pieces of the puzzle fall into place the action and suspense is ratchet up to a heart-pounding finale that leaves you both satisfied and craving for more. 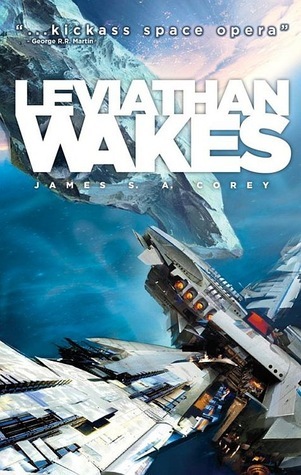 Leviathan Wakes has everything you would want in a space opera - great action scenes, nail biting space battles, unscrupulous corporations and an alien threat with a macabre twist. If you are looking for a breathtaking space adventure focusing on the characters rather than the technology then look no further. I thoroughly enjoyed it and I definitely can’t wait to see what the writing duo will dish up in the sequel, Caliban’s War. George R.R. Martin is one of the most exciting storytellers of our time, a stylish, elegant writer who combines riveting plots with superb characterisation. He writes with equal verve and fervour about werewolves as he does spaceships, wizards and vampires, and he has won virtually every award in the fields of fantasy literature. This massive collection features the very best of George R.R. Martin's short fiction from the last thirty-some years. I’m a complete newcomer to George R.R. Martin’s work. After reading A Game of Thrones earlier this year (which I loved) I wanted to explore some more of his work. 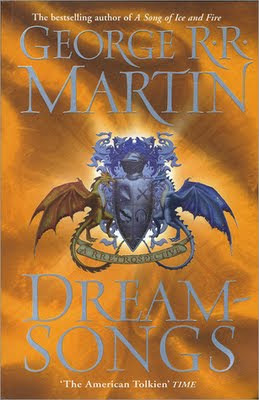 As luck would have it my local library had Dreamsongs: A RRetrospective sitting on their shelves. It’s a good thing that I like reading hefty tome, since this one clocks in at an intimidating 1159 pages in trade paperback format (which might explain why it was only borrowed twice before I got my hands on it). Dreamsongs is a veritable treasure trove of George R.R. Martin’s short fiction and contains a collection of 34 short stories, novellas and teleplays. The book is divided into nine sections each starting with commentary from the author sharing background or thoughts on the tales that follow. Martin has written horror, fantasy and science fiction and he shines in each genre. I quite like his ‘furniture rule’ when it comes to genre classification. ‘We can make up all the definitions of science fiction and fantasy and horror that we want. We can draw our boundaries and make our labels, but in the end it’s still the same old story, the one about the human heart in conflict with itself. The rest, my friends, is furniture. The House of Fantasy is built of stone and wood and furnished in High Medieval. Its people travel by horse and galley, fight with sword and spell and battleaxe, communicate by palantir or raven, and break bread with elves and dragons. The House of Science Fiction is built with duralloy and plastic and furnished in Faux Future. Its people travel by starship and aircar, fight with nukes and tailored germs, communicate by ansible and laser, and break protein bars with aliens. The tales included in Dreamsongs range from Martin’s earliest work up to the present and you get a clear sense of how his proficiency as an author has evolved over the years. I’m not going to rate each story. Some of them are average some exceptional, but all are enjoyable. I have to highlight a couple that stood out for me. A Song for Lya is a great science fiction tale that deals with alien religion, love and loss. The Ice Dragon has elements of what later became the Song of Ice and Fire series. Meathouse Man is a truly macabre tale where corpses are used as part of the workforce. Nightflyers is riveting blend of sci-fi and horror that deals with a haunted spaceship. The Monkey Treatment is for all those dieters out there, after reading this one you’re bound to be far happier with your weight. The Pear Shaped Man is a creepy tale that will change cheese curls into objects of horror forever. The Skin Trade is a great werewolf story with a twist. And finally, to round things off there’s the excellent Hedge Knight, a prequel of sorts to the Ice and Fire series. This is an absolute must read for any George R.R. Martin fans or anyone who wants to see if they would like his work without committing to the Song of Ice and Fire series. I don’t generally read short fiction, but I completely lost myself in this collection for the past week. Except for getting new books there is nothing us book lovers enjoy more than showing our book collections to the world. On My Shelf is a monthly opportunity for you to do just that. 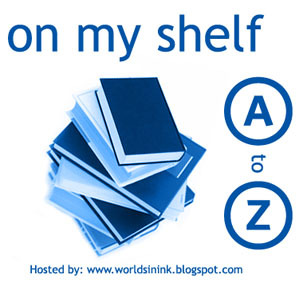 It’s all about sharing the books on your shelf in alphabetical order, according to author. It’s a very chilled-out meme, so you can plan it in any way you like, and post at any time of the month, any number of times you like. You can share your books in any way you want. Post a list of your books, post pictures or do a YouTube video. It's completely up to you. Do you have a huge book collection? Don't fret. You don't need to post each and every book. Share only those that you really love or highlight a couple that you think everyone else should read. Each month we’ll cover different letters of the alphabet which will give you the chance to show the world which authors have that coveted spot on your bookshelf. Post your own On My Shelf post(s) to your blog. Please include a link back to this post so other people can find out what it's all about and join in if they like. Add a link to your OMS post(s) to the list below and that's it! Link submissions for 'C to D' posts closes on 30 September. You can also submit your 'A to B' posts over here if you want to catch up. My "book buying ban" went the way of the Dodo and I'm not too sorry that it did. 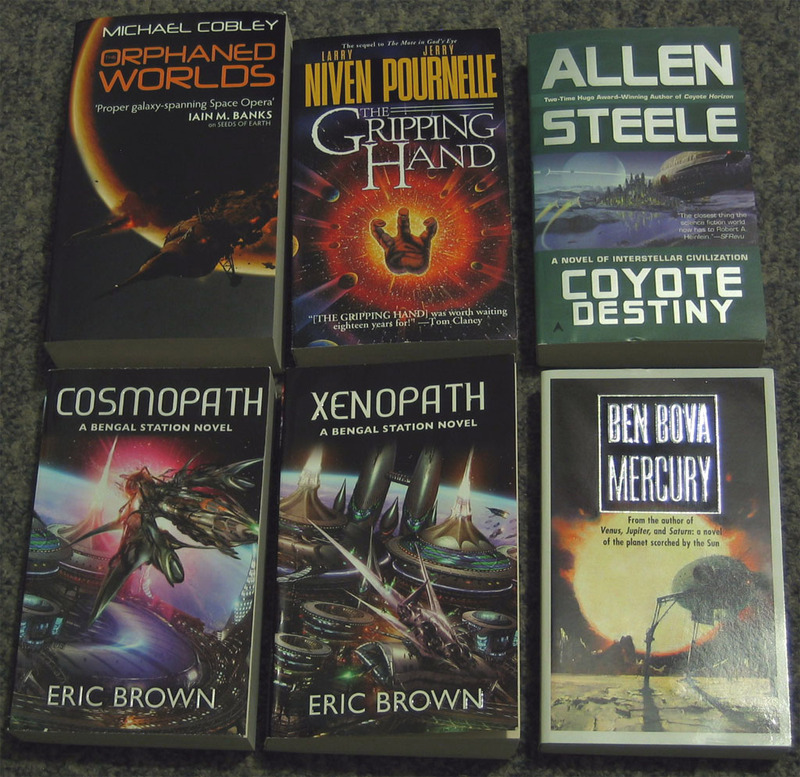 Today I received the first of two parcels from Better World Books. 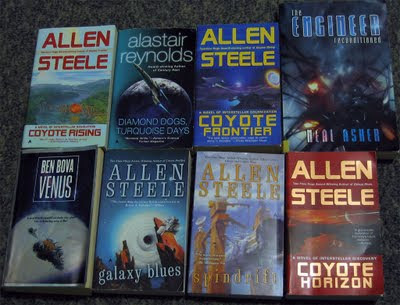 These are all secondhand hardcover copies. 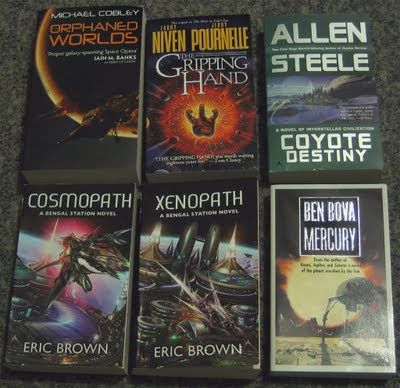 When buying new I can normally only afford paperbacks, but BWB's prices for secondhand hardcovers are actually the same as new paperbacks if you order in bulk (5 or more books, which I normally do!). My only disappointment is that the dustcover of Beneath the Gated Sky has a large triangle cut out of it. Who would deface books like that? The horror!